I’m a regular follower of several people’s photo streams on Flickr, especially those I discover via their frequent contributions to the Karachi Metroblogging Flickr Group. I was surfing through my favorite photo bloggers’ streams as always a few days ago, when I discovered that a fairly large bunch of Karachi based Flickr users had recently gotten together for “meet up” at Sea View. Gear in Air, originally uploaded by smrafiq. Anyway, there is plenty of more interesting information and photos over at a thread at The Pakistan Photographers Group if you’re interested. And I apologise if it seems like I’ve been eves dropping on everyone’s comments on Flickr, but they are all public, and its hard for a social networking addict not to feel excited at such development! :-> What’s this news I hear about the possibility of a Karachi Photographers Club being launched, is this why you guys met up Chowkandi too? Your fans are all ears, please enlighten us. And do keep the excellent photos coming in! introduce new people to the group and seniors and just a field trip. 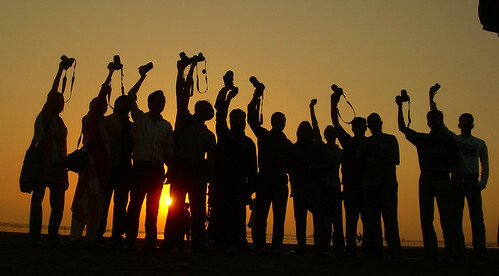 As a Karachi-based photographer I take great pride in informing you all that we indeed had the finest and the biggest ever meet-up of Flickr photographers in the history of the country. We are not sure if it will stand the test of time but we know that we’ve done something others haven’t. Make no mistake here. We, as a matter of policy, do not arrange meet-ups or gatherings for records or free publicity. We do it to learn and allow others to learn. And to teach. And to share. And, as many visitors have told us, to relax from the grinding mundane of what life has become: A 9 to infinity meal. Therefore, it is good to have meet-ups not only to keep oneself abreast with new ideas and latest information on products and personalities, it is also quite necessary to have such activities to keep one’s mind on the line. If you are a photographer and if you want to join us, continue reading our posts at Karachi Photographers Club or at PPG. @WASIQ shoq da koi mool nahi.